HOME日本的share house情報最新消息&部落格入住者限定專屬計畫International experience through the world's cuisines! A new program only for our tenants has started! Hello, everyone! This is Yuya from Borderless House planning team! It's getting warmer, spring has arrived! So you must be excited for new life! With the coming of spring, our new program has started! This new hands-on program has started! Food is closely related to cultural costume! Let's touch different culture with five sense! See! Feel! Taste! 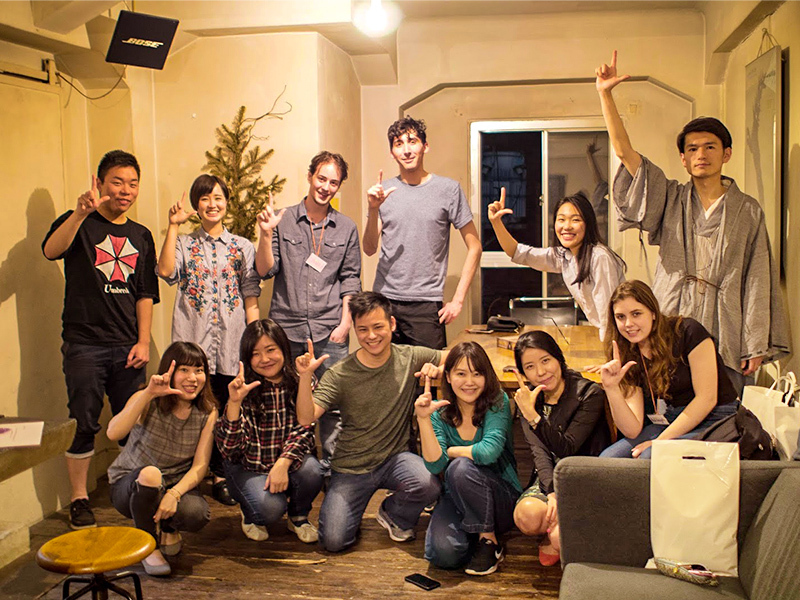 LINK UP, which was run as a Borderless House exchange program last year. We received many happy comments from the tenants, such as "new connections with other share houses!" LINK UP is a program which provides the tenants with the opportunity to meet and connect through languages and interests. During this program, we also received comments that "I want to know more about various countries!" And "I want to touch culture and international experience more deeply!" That is because we restart the program as "BORDERLESS DINERS". 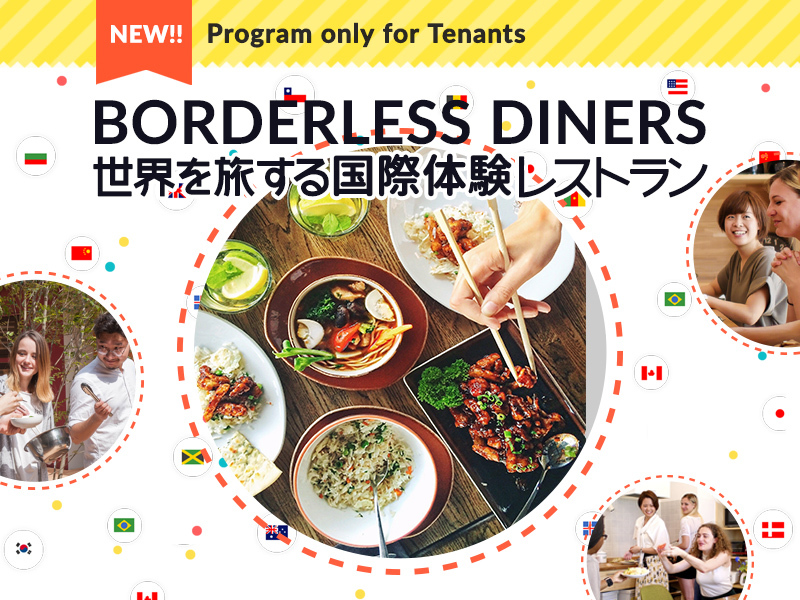 "BORDERLESS DINERS" is an international experience program focused on "food" in order to make you feel and learn deeply the countries of the world. We are going to reserve restaurants in various countries in Tokyo for this problem! Eat! Talk! think! It is a hands-on program where you can enjoy the international exchange with the five senses. The program will be held once a month for our tenants only. The maximum number of participants is only 20 people in this program, so you can interact with people more closely, which is a bit different from big events! This program was launched with the wish of experiencing different cultures through "food" and enjoying the differences. Italian, French, Chinese, Korean cuisine and ethnic food such as Thai food! I believe that these types of dishes are familiar to everyone. However, there are many countries that you may know the name of such as Myanmar and various African countries, but you have never eaten their foods! The world has a variety of dishes unique to that country, and each dish has its own story and culture. For example, because Japan has four seasons and the ingredients available in each season differ, Japanese food culture has developed along with events and seasons. Furthermore, there must be many people who think of "niku-jaga" when hearing the words Japanese home cooking? Do you know the origin of this national soul food of niku-jaga? ? Actually, the origin of niku-jaga is beef stew! What I mean is, "niku-jaga" was born as a result of the trouble of a certain historical person who could not forget the taste of beef stew and somehow wanted to make it in Japan. Thus, traditional menu items actually contain rich international origins, and conversely, in some cases, they come from a culture that has been developed for religious reasons, and it can be seen that the origins of foods are very deep! "Food" is a very familiar means of learning about a country. It is our hope that while eating the food of a country, you can learn about that country. Through cooking, countries that were previously "unknown" become countries that you "would like to know more about" and "would like to go to"! We aim to create a program that allows you to experience such things. Venue changes every month! Traveling through food program, the first country is Myanmar! 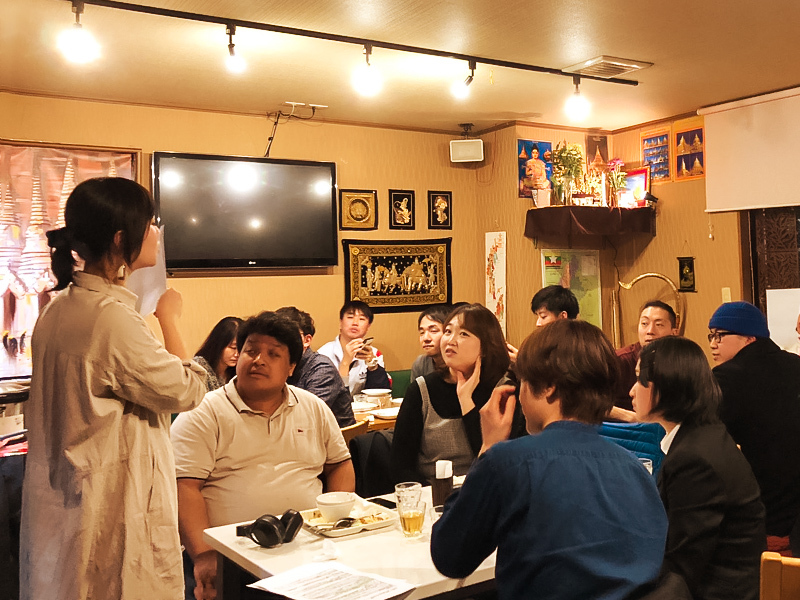 This program was held in Myanmar restaurant which is located Takadanobaba on Feb 22. 4 Koreans, 1 Franch, 1 Saudi Arabian, 1 Taiwanese and 8Japanese participated! The ratio of male to female and ratio of nationality aere also slmost 50:50! Is this place Little Yangon! ? A long-established cafeteria loved in Takadanobaba where 1,500 people from Myanmar live. In fact, Takadanobaba is a fierce battlefield of Myanmar cuisine with over 20 such restaurants. 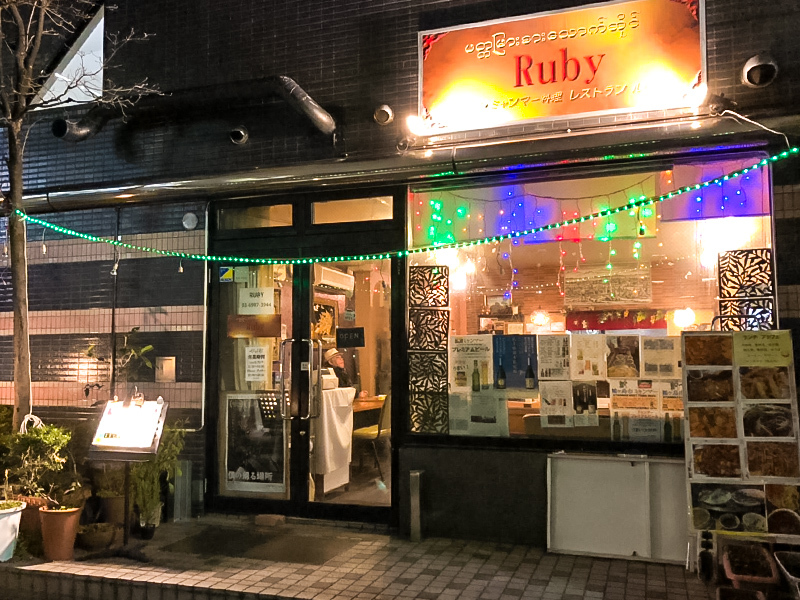 Ruby, where the event was held this time, is a long-established Burmese restaurant that has been open for 20 years in Takadanobaba! Naturally, the restaurant staff is also from Myanmar! 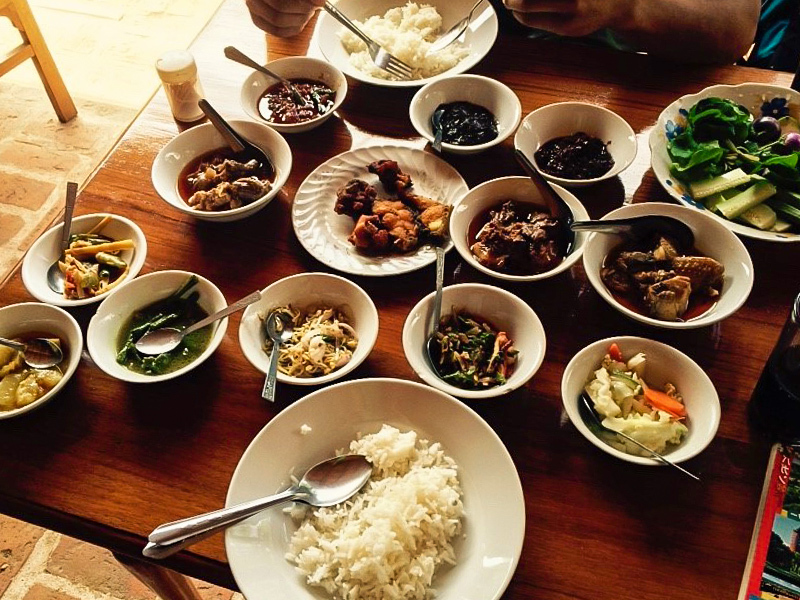 You can enjoy authentic cuisine from Myanmar. What kind of country is Myanmar? ? The manager of the restaurant told me about Myanmar. Start of program! What kind of country is Myanmar? Myanmar is located in Southeast Asia and has about 1.8 times the area of Japan. It is a devoutly Buddhist country with over 100 ethnic groups, and there are several temples and pagodas on the streets. Reportedly, when he happened to come to Japan to travel 30 years ago, when he was listed as part of an anti-government organization by the military government, and unable to return home, became a refugee. I told me valuable stories and exciting stories, such as the story of his time 30 years ago in Japan, the story of being able to return home for the first time in 20 years last year, and stories about Burma during the military administration and Myanmar in the present. What impressed me the most was the story of Kyaw Kyaw Soe-san's dream. "Myanmar, which I returned to for the first time in 20 years, has become unrecognizable, but after since the government has changed, the people have no sense of unity. Therefore, I would like to spread the school song culture that I learned in Japan in Myanmar. I would like to make school songs so that students sing together and head toward the same goal." Hearing such precious stories is part of the appeal of this program! The participants also find it interesting. And finally, it was time to eat the cuisine from Myanmar! Myanmar is surrounded by five countries, and Myanmar has absorbed the delicious points of the cuisine of these five countries! Myanmar food is characterized by being a little bit spicy and a little bit oily. In fact, Myanmar is surrounded by China, Laos, Bangladesh, Thailand, and India, and it is a multi-ethnic country in which various ethnic groups and cultures are mixed. Therefore, the variety of dishes is also diverse! The cultures of the surrounding countries have influenced the cuisine, and there are very good dishes from many countries, as the cuisine has incorporated the spiciness of Indian food, the quick and easy cooking methods of Chinese food, and the sweet and sour taste of Thai food. This time, various dishes were prepared, such as the national dish that can be eaten in Myanmar to dishes that are eaten for celebrations such as weddings. Some people were a cautious about trying the foods, and some dug in quickly! You could hear the voices of the participants at different restaurants saying, "This is spicy", "This is delicious! ", etc. The origin of udon is Burmese noodle nan gyi thohk? ! Connections in the world as seen from food! Because there were participants from various countries, the predictions of each person varied! It was a heated discussion! For example, "The udon salad is probably a kind of reimen in Japan because it is so light." "Perhaps sweet foods are used for celebrations? So tapioca and sweet potato desserts must be for weddings!" Then, the answers were presented. Have you ever seen this dish? Don't you think that it looks like udon? Yes, this is actually udon found in Myanmar. The name of this dish is nan gyi thohk, and it is a type of udon salad. The recipe for the noodles is almost the same as that of udon! It is made of soybean flour, and people in Myanmar eat the salad when they want to feel refreshed. It is home cooking and is often eaten as a daily meal. It is the same as in Japan, right! Then, Kyaw Kyaw Soe-san said that this is the origin of Japanese noodles. "The taste and texture of the noodles are almost the same as those of udon. so please try it once if you are interested! There was also a dish called dan bauk, which is eaten during celebrations such as weddings. It is a simple dish of stewed chicken and butter rice. But making it is hard! It is a dish that is very time-consuming to make as various spices are mixed and it is stewed for a long time. 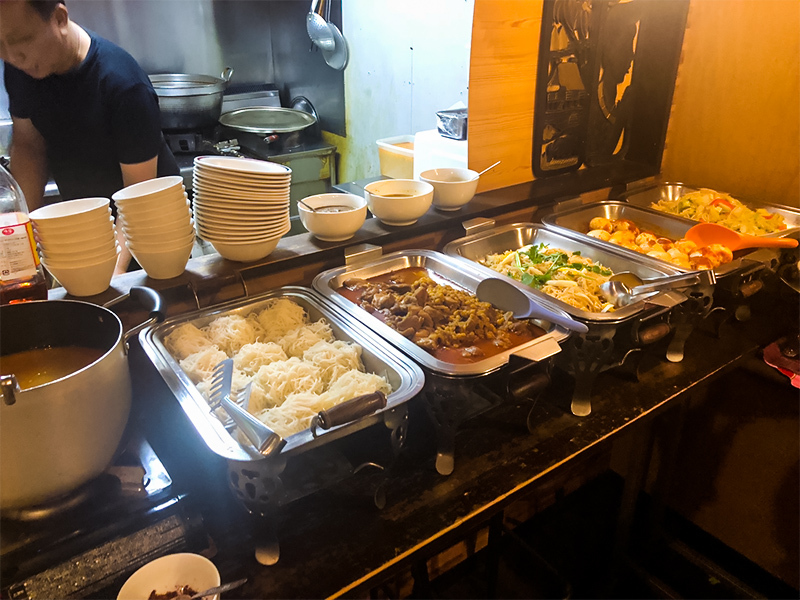 However, once it is made, it can be served immediately like curry, and it was explained that it became a dish of hospitality served for celebrations since guests are not kept waiting. 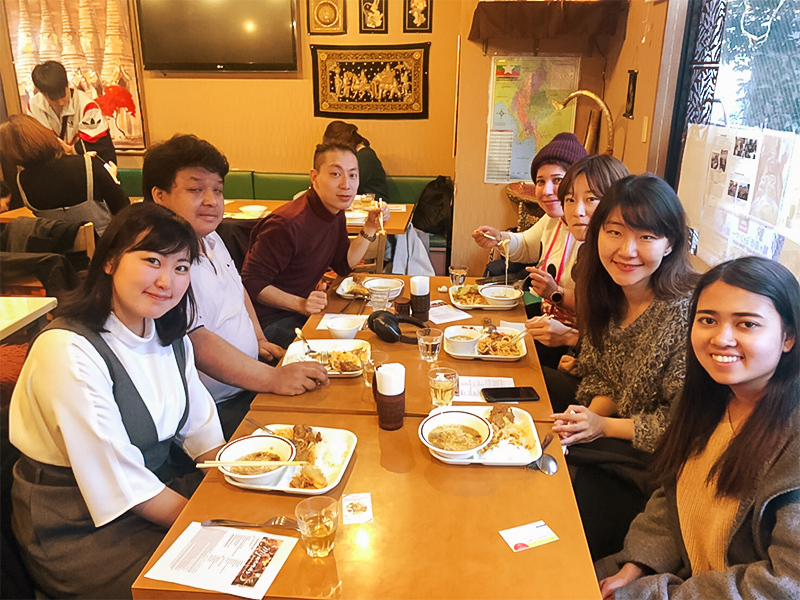 In this way, even in a seemingly distant country, Japan is actually connected like a relationship with nan gyi thohk, and we realized that the heart of hospitality for cooking is universal! If you order "the food served in the Borderless House program", you will be able to eat these foods, so if you are interested, please check out RUBY in Takadanobaba! Finally, recommended spots in Myanmar were presented, and the program was concluded! 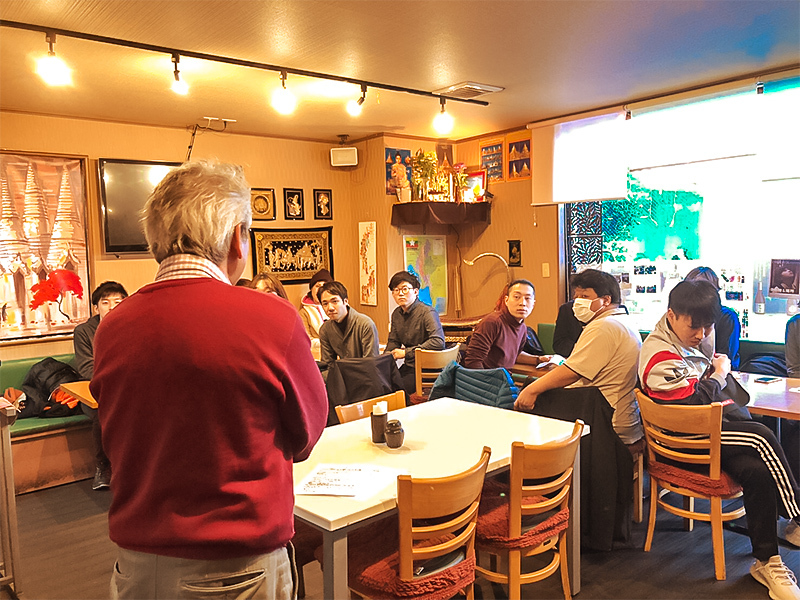 Then, a male participant invited everyone to a house party saying, "There will be a party at my shared house in Iriya tonight, so everyone is welcome to join and continue talking about the program!" 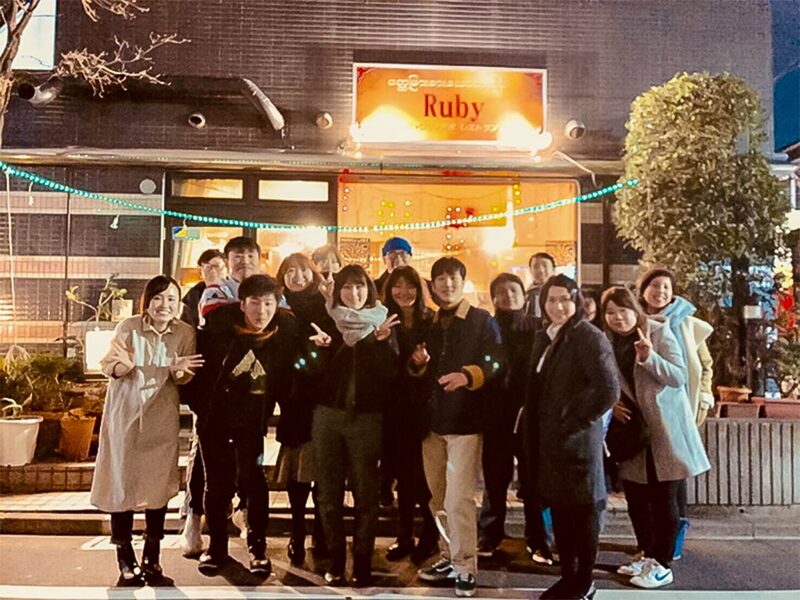 In this way, the Borderless House program is also able to connect with more than 700 share mates living in 69 share houses in Tokyo! Next travel is SENEGAL!We will do live cooking next time in Shinjuku Honan-cho, our share house! The cheerful senegal chef make Senegal cuisine for participants.I hope you will enjoy the next blog! Venue and food change every month! Traveling through food international experience restaurant. Why don’t you stay in Borderless House that you can join this kind of programs?